“Now you're looking like a line from a Vandross song/ I'm looking at that fine little dress you got on/ don't get me wrong, girl, I love it/ now I just wanna talk you out of it.” - Talk You Out Of It - Michael Hardy-Hunter Phelps-Jameson Rogers-Alysa Vanderheym. When marathon chart-toppers Florida Georgia Line return here this week as headliners on their second Australian tour they have a chance to expand their diverse video catalogue. The duo released a video for latest single Talk You Out Of It from their 19 track fourth album Can't Say I Ain't Country that was launched last month. Their CD was preceded by singles Sitting Pretty, Colorado and Platinum chart topper Simple - their 16 th #1 hit. 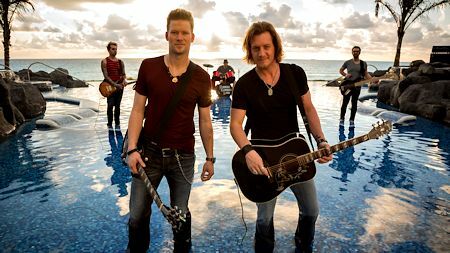 Band creators Tyler Hubbard and Brian Kelley co-wrote over half the tracks with guest collaborations by Jason Derulo, Jason Aldean and Hardy. The hedonistic theme of Talk You Out Of It is a vast contrast to their previous Biblical videos including one filmed at the 12 Apostles on Victoria's Shipwreck Coast on their 2016 tour with Georgian star Jason Aldean. Hubbard and Kelley have perfect Christian credentials - they met as Nashville university church youth group worship leaders in 2008 and precede all concerts with prayers. "Talk You Out Of It has a very different feel for us," Hubbard, 32, revealed. The song is fuelled by a banjo riff mixed with R & B elements. “The vibe was just so money,” says Kelley, 33, “nothing like a good date night in." It's unlike their Confession video on second album Anything Goes filmed in an abandoned Nashville church, replete with home movies and ignited by burning candles, fires and a confessional. 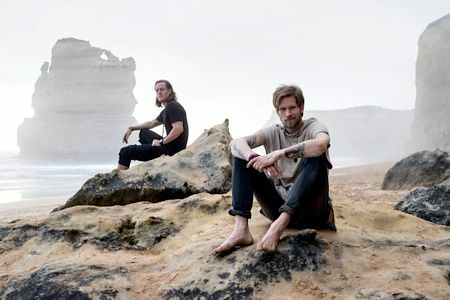 They filmed their video for Holy (High On Loving You ) from third album Dig Your Roots at the famed 12 Apostles near Loch Ard Gorge on their tour with Aldean. The duo lured their wives Brittney Cole Kelley and Hayley Hubbard to cliffs near Port Campbell to appear. But it's not the first time the Florida femme fatales appeared in their videos. “The stripped-down cliff-side scenes and sweeping vistas of a 25,000-year dormant volcano, matched with lyrics of love's salvation, culminate in an astounding visual as an ode to their wives,” was how the video was promoted in the U.S.
“There's something to be said for sharing your life with someone. We're officially a team now. We're building something together,” Kelley said of creative input of their wives who have also produced babies. It's unlikely the duo was privy to veteran Shipwreck Coast pioneer outlaw band The Dead Livers mystical hit Holy Mary that also name checked Apollo Bay, Port Campbell and Warrnambool in its religious imagery. Florida Georgia Line headlined the sold-out CMC Rocks Queensland festival in Ipswich March 14-17. The duo is touring with fellow stars - Georgian Thomas Rhett and Tennessee preacher's son Morgan Wallen. 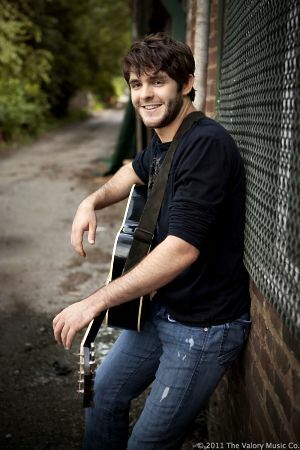 Rhett, 28 and son of singer-songwriter Rhett Akins, has scored 11 #1 country hits from his three albums It Goes Like This, Tangled Up and Life Changes . They played Cairns on March 15, Sydney on March 18 and return to Rod Laver Arena on Wednesday March 20. The duo featured Brooklyn born Beba Rexha on their marathon chart topping hit Meant To Be and filmed that video at Grandview Motel in Albuquerque , New Mexico , and Isleta Amphitheatre concert on October 1, 2017. They collaborated with The Chainsmokers on Last Day Alive , Backstreet Boys with God, Your Mama, And Me , Ziggy Marley on Life Is A Honeymoon , Tim McGraw on May We All and Nelly on Cruise. 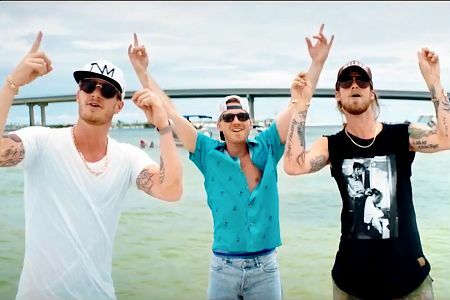 The duo has sold more than 5 million albums and launched their Old Camp Peach Pecan Whiskey, FGL House restaurant and Tree Vibez Music publishing company. It's as far-cry from when Kelley was a star high school baseball pitcher from Ormond Beach , Florida , who was at Belmont University in Nashville and began writing music inspired by Christian rock group Casting Crowns. Hubbard, a native of Monroe , Georgia , formed hip hop group, Ingenious Circuit in his teens and met Kelley as joint worship leaders at college. Florida Georgia Line join Shotgun Willie Nelson, Toby Keith and Brothers Osborne in reaping hay from the harvesting of new marijuana laws in diverse American states. It's reflected in inclusion of Colorado on their new disc. There's also dashes of down-home humour in their skits by a friend Brother Jervel , on All Gas No Brakes, Sack'a Puppies, Catfish Nuggets and album entrée Tyler Got Him A Tesla . “So we did like four comedic skits or voicemails that kind of segue into the next song in our album and we're really excited about it,” Hubbard revealed. The duo also appeared with tour partner Wallen in his video for his #1hit Up Down on his debut album If I Know Me. It features Morgan, now 25, and Florida Georgia Line on a beach and in concert. Although the duo enjoys a hedonistic flavour in hits Cruise and Simple , they say they're not far, spiritually and personally, from their days as worship leaders. “I think our faith comes through in a lot of different ways, if not directly in our music,” confessed Hubbard. “But it's really starting to, as well, come out in our writing and our music. The biggest thing for BK and myself is, we've always taken pride in being transparent and being who we are and letting our fans in on our lives. I think that's one reason they connect so well to our music and who we are. Those blessings include writing for other artists including the Jason Aldean single You Make It Easy. Hubbard revealed Aldean, who headlined their previous Australian tour in 2016, is featured on Can't Hide Red - one of their new songs. "You know what we got Aldean to sing one with us," Hubbard revealed. "We don't have anybody else locked down. We're still waiting for the right opportunities. We don't like to force that. Just kind of wait and see what happens. We're really excited about the song we did with Aldean. It sounds awesome." Florida Georgia Line's music has been labelled bro-country but the duo expands beyond that. “ Garth Brooks and Tim McGraw inspire us,” Hubbard explained. “It's fun to not only blaze a trail in music, but also in other areas of our lives in business, whether it's fashion, in the restaurant business or publishing,” Kelley revealed. “It's a blessing every day to wake up and create. Ultimately at the end of the day what drives us is creating. The duo expanded writing for their own albums with composing songs for peers diverse as Cole Swindell and Billy Currington. “BK and I moved to Nashville to pursue song-writing and at that time we had no idea that we were going to be an artist,” Hubbard revealed. And their 10-year relationship has survived despite the pressures of maintaining success. “We take a lot of pride in trying to keep that thing healthy,” Hubbard explained. Florida Georgia Line, Wallen and Rhett play Rod Laver Arena on Wednesday March 20.